Boxing fans got a heavy dose of what they love from Quebec City last night with plenty of knockouts and some great action. While those who tuned in to the HBO broadcast saw two light-heavyweight champions score impressive wins, the fans at the Pepsi Coliseum were treated to some lively undercard matches, the exciting 12 round tilt between welterweights Kevin Bizier and Jo Jo Dan being the highlight. Dan took a split decision over Bizier in an entertaining if rather sloppy affair which begs for a rematch. Sergey Kovalev provided the most emphatic performance of the night. Many among the boxing intelligentsia were calling his match with former top contender Ismayl Sillakh a “sleeper fight” with the underdog having a better than expected chance of pulling off the upset. Instead, Kovalev decided matters with his first clean power shot upstairs, a right hand to the side of the head early in round two that sent Sillakh down hard. The Ukrainian rose and appeared able to continue but Kovalev immediately smoked him with another right and two lefts. Sillakh toppled and the referee didn’t bother to issue a count. Another impressive knockout for “Krusher” Kovalev. Kovalev had no trouble at all with Sillakh. Asked by Max Kellerman who he wanted to face next, the Russian bomber answered with one word: “Adonis.” And a few minutes later “Superman” himself and British challenger Tony Bellew went at it in the main event. Bellew, to his credit, showed discipline and determination as he worked to keep his powerful foe at arm’s length and if his strategy was to survive the early going while slowing the tempo of the fight, he succeeded admirably. Boos were heard from the capacity crowd in rounds three and four as the match proceeded at a fairly pedestrian pace with Stevenson constantly stalking and Bellew moving around the perimeter, working to keep the champion at bay. 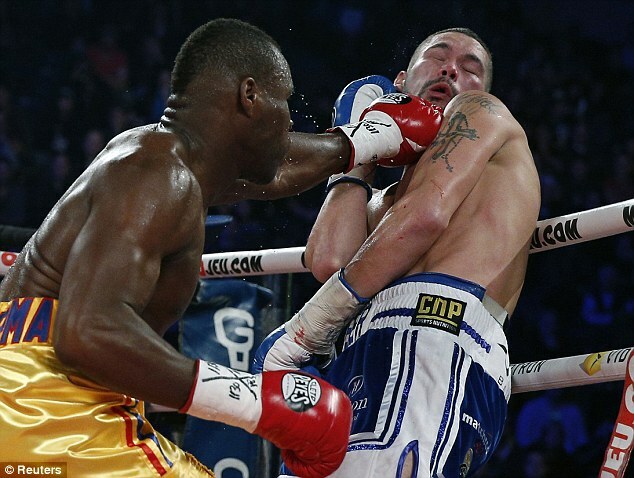 Suffice to say, Stevenson vs. Bellew was a less explosive affair than Kovalev vs. Sillakh. Bellew wasn’t winning rounds, but he was fighting his fight, his key tactic being to counter Stevenson’s big left hand with his own right. He did land a few sharp ones, even bringing some blood from the champion’s nose, but Adonis not only took the punches well but quickly adjusted, slipping the right and turning to counter-attack. 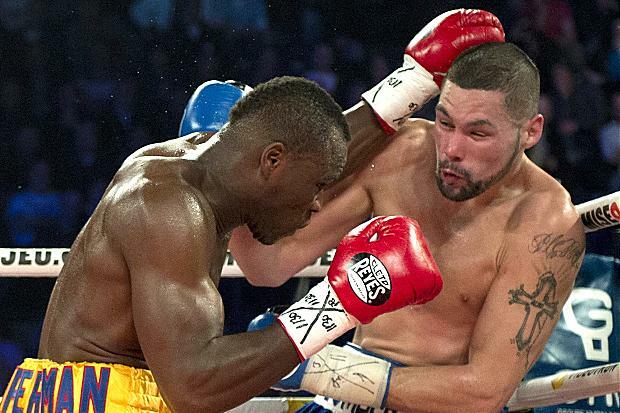 As a result Bellew became gun-shy, counting on his legs and a long left lead to stay out of trouble. Against a powerful destroyer like “Superman,” that just isn’t enough. The key to victory for southpaw Stevenson proved to be firing his potent left hand to Bellew’s body which in turn created new openings for punches upstairs. In the sixth the champion made another adjustment, anticipating Bellew’s movements and firing his cannon in uppercut mode. It was such a shot that effectively ended the fight, landing flush on Bellew’s jaw and pitching him to the canvas. The challenger rose and, no doubt recalling how referee Michael Griffin ended Stevenson’s bout with Chad Dawson, went to great pains to convince Griffin he was fit to continue. But once the action resumed it was clear Bellew had nothing left. Another powerful left connected flush and a second would have put the challenger on the canvas again had he not been supported by the turnbuckle. Bellew was stunned, his head lolling on his shoulders, as Griffin pulled the champion off and declared him the winner. Adonis was more coy than Kovalev when answering Kellerman’s questions immediately following his fourth knockout win of the year. He stated that if the financial terms were to his liking, he had “no problem” taking on the fearsome Russian, but he also stated that he deserves a vacation and that he would prefer to face Carl Froch or Bernard Hopkins, though his attempt to inspire the fans to cheer a match against Froch or “The Executioner” fell completely flat. 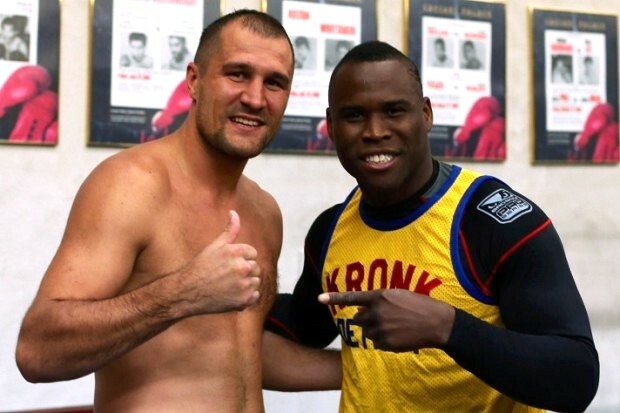 The simple fact is a number of obstacles would need to be faced to make either of those bouts happen while the Kovalev bout, as far as anyone can tell, is there for the taking. Stevenson’s power was too much for Bellew. But at the post-fight press conference, Stevenson dropped a bombshell to the assembled media, indicating he was seriously considering leaving Quebec for the United States. Adonis vs. Sergey is a big fight no matter where it happens, but it will be bigger in Montreal or Quebec City. There’s also the possibility to be considered of Stevenson fighting the winner of January’s all-Montreal showdown between Jean Pascal and Lucian Bute. This match too would be something less of an event if Adonis packs up and takes his family to New York or Las Vegas. But the French-language media went to town this past week on the champion’s criminal past, exposing the sordid details and interviewing a woman he abused before being sent to jail for four years. He revealed that the stress of this exposure proved a major distraction leading up to the bout and for the first time he was seriously questioning whether it made sense to stay in his hometown (Stevenson is Haitian by birth but came to Canada as a young child). One has to wonder about the fairness of this attention, while at the same time acknowledging its inevitability. The simple fact is Stevenson paid his dues, turned his life around, and is now a world champion and a husband and father, a success in every way. His should be an inspiring story, but the tone of this recent coverage was not positive and Tony Bellew tried to use it in his favour, calling Stevenson a pimp at the weigh-in.